Zaha Hadid Architects have completed a showroom in London for Spanish bathroom brand Roca. Undulating white walls surround a reception and lounge area that snakes through the interior of the Roca London Gallery, which is located on the ground floor of a mixed-use building near Chelsea Harbour. Shiny plastic benches and desks furnish the space, while bulbous light fittings of the same material are suspended overhead. Arched openings lead from the reception into concrete caves, where products are displayed on integrated shelves and lights sit within recessed grooves. These rooms are formed from a jigsaw of glass-reinforced concrete elements that slot against one another with visible seams. Around one corner is a glazed meeting room, whilst elsewhere are a series of interactive touchscreens. Roca intend to use the showroom as a venue for exhibitions, seminars, meetings and other events. Some other buildings with cave-like interiors were recently highlighted on Dezeen in a special feature - see these projects here. Other London projects by Zaha Hadid include the aquatics centre for the London 2012 Olympics and the Stirling Prize winning Evelyn Grace Academy - see these projects and more by Zaha Hadid here. 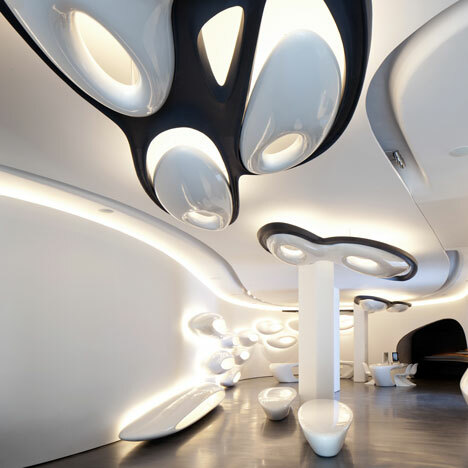 The Roca London Gallery consists of a single floor measuring 1,100m2, where, as the Zaha Hadid studio intended, it appears that water has sculptured and defined each and every detail of the space. Roca‟s commitment to design and innovation is clearly visible in the exterior of the building with its distinctive and unique façade which gives the Roca London Gallery its identity. Three almost organic portals which appear to have been shaped by water erosion open up this space to the city. The movement of water is the overriding theme in the Roca London Gallery – flowing and merging exterior and interior spaces. The interior is sculptured white concrete and its state of the art lighting connects each of the different areas whilst serving as a central axis around which the Roca London Gallery revolves. The interior is fabulous, functional and flexible, featuring cutting-edge, modern, audiovisual, sound and lighting equipment. This technology provides interaction with the brand and the opportunity to discover the company‟s history, its landmark achievements and the values on which all of Roca‟s work is based: the commitment to sustainability and particularly to innovation, design, wellness and saving water.